The Board of Pharmacy Specialties (BPS) approved its 12th specialty certification, Compounded Sterile Preparations (CSP) Pharmacy, on February 27, 2018. The purpose of offering the BPS CSP Pharmacy certification is to ensure that pharmacists are competent to perform and oversee compounding activities. Increased Need for Compounded Patient-Specific Medications. In recent years, there has been an increased demand for patient-specific compounded medications. Organizations are responsible for ensuring that these compounded medications are prepared safely and effectively. The Impact of Drug Shortages. The significant number of drug shortages affecting the industry has led to institutions seeking outsourced CSPs; organizations must be accountable for the safety and efficacy of these medications. The Effects of Multiple Compounding Tragedies. The September 2012 New England Compounding Center (NECC) tragedy is one of many publicly reported disease outbreaks resulting from improperly prepared CSPs. The meningitis outbreak, which sickened over 800 and killed 76 people, was the result of NECC’s contaminated steroid injections. This incident exposed the need to create a robust process to ensure that those pharmacists working in the area of sterile compounding have the knowledge and necessary skills to ensure patient safety. The new BPS CSP certification is a response to the increased need for patient-specific medications, the impact of drug shortages, and serious compounding errors, which underscore the need for a process to independently validate the knowledge and skills of compounding pharmacists. The ultimate goal of compounding specialization is to ensure medication safety and improve patient outcomes. However, despite these new efforts and regulations, there is still a demonstrated lack of consistent pharmacy compounding activity competency. BPS compounding certification may be a significant step in assuring patients, health care practitioners, and regulators that sterile compounding is performed safely and accurately. BPS anticipates that certification of CSP pharmacists will lead to improved compliance with rules, regulations, and standards for practice and will result in fewer adverse events related to CSPs. Health care providers, hospitals, and other health care institutions are being held increasingly accountable for the quality of care delivered to their patients. Empowering those pharmacists interested in this compounding specialty highlights their commitment to patients’ overall safety and the quality of service provided. Ideally, at least one BCSCP will be employed in every hospital, home health care environment, nuclear pharmacy, and other pharmacy areas where sterile drug preparations are compounded. The BCSCP pharmacist specialist would be accountable for the supervision, training, competency assessment, safety, and oversight of other personnel who are involved in this work. It is highly likely that BPS-certified pharmacists will be committed to their specialty practices and will remain skilled and competent throughout recertification practices. BPS intends to offer the first examination for the CSP Pharmacy certification in the fall of 2019; the tentative start date for the initial application period is early May, 2019. 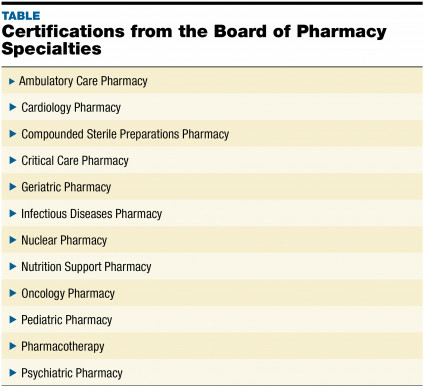 A full list of BPS specialty certifications are listed in the TABLE. Pharmacists who would like to prepare for the certification exam should study compounding information from outside organizations, state, and local professional associations and colleges of pharmacy. Candidates should seek out reputable information and accredited programs; USP Chapters <797> and <800>, FDA guidances for compounding facilities, and literature on sterile compounding and facility engineering and certification are the cornerstones of this specialty. Guidance from programs offered by ASHP, CriticalPoint, the LP3 Network, the American College of Apothecaries, the Professional Compounding Centers of America, Spectrum Pharmacy Institute, and many others may be useful when preparing. Michigan is the first state to require accreditation/certification of compounding pharmacies by one of three entities: TJC, the NABP VPP, or the PCAB. BPS expects that other states will follow. By creating the BCSCP specialty, BPS has made it possible for qualified pharmacists to distinguish themselves as experts in sterile compounding. With this certification, pharmacists will have an opportunity to gain the respect and recognition already shared by other clinical specialties. Dianeysis Haro Avendano, PharmD, received her Doctor of Pharmacy degree with highest honors from Nova Southeastern University in 2004. She started as a clinical pharmacist at Hialeah Hospital 13 years ago, where she later became pharmacy supervisor and clinical coordinator. Dianeysis currently practices as the clinical coordinator and sterile compounding advisor for Memorial Hospital Miramar Pharmacy Department in Florida.